Named after Greek Goddess Maia, who is commonly recognized as a symbol of fertility, May is a month of life and awakening. Like the month itself, those born in May are a vivacious bunch, inspiring those around them to follow their dreams and live life to the fullest. Just like the month it represents, the May birth stone is vibrant in both color and meaning. Mined since as far back as 1500 BC, the emerald is a symbol of life and rebirth. The name “emerald” comes from the Latin word, “smaragdus”, meaning green gem. The hypnotizing beauty of the Emerald has made it a long admired and sought after stone throughout history. In fact, one of the best-known fans of this green gemstone was the most famous rulers in history, Cleopatra. Not only did this Egyptian Pharaoh have her robes adorned with emeralds, but she was even known for having her own Emerald mines! First officially cultivated in 1420, the Lily of the Valley has major significance in Eastern and Western worlds, representing happiness and renewal. With a scientific name like majalis, meaning “belonging to May”, it’s only fitting that this fragrant flower represents those born in the month of May! The simplistic beauty of the Lily of the Valley has also led it to be a popular flower for weddings and in bridal bouquets including the bouquets carried by Catherine Middleton, Duchess of Cambridge and Princess Grace Kelly. Those born in May fall under one of two astrological signs – Taurus (April 20 – May 20) and Gemini (May 21 – June 21). You’re unlikely to find someone with more determination and perseverance than a Taurus. They are known for seeing things through completion by any means necessary. Gemini the Twins, on the other hand, are known for their social and inquisitive nature, taking on multiple projects at one time, but not always seeing it through to the end. Those born in May are used to having the spring weather as backdrop to their celebration, so celebrate their birth season by sending them a delicious basket full of delicious flower cookies from Cheryl’s! 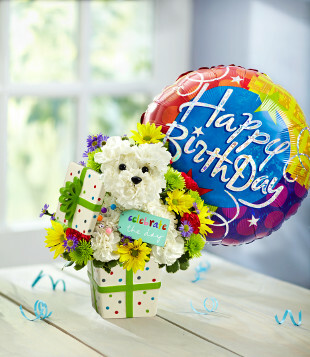 A happy pup made out of carnations and tied to a festive balloon is just the perfect surprise to send your special someone. This party pooch is even surrounded by a field of green poms, the perfect complement to that emerald birth stone! There’s nothing quite like chocolate to add some sweetness to the day, so surprise someone with a birthday card full of decadent Fannie May® Pixies, delivered right to their door! May is also the time when Peonies are in season! Peonies are big, delicate flowers that are a crowd favorite. A couple stems in a cute mason jar is all you really need for a beautiful arrangement. You can learn all about Peonies & how to care for them on our blog post here!